The criminal? A 4-foot-tall, 20-pound ventriloquist dummy. There’s a lot of weird things going on in this image, from the unsettling stare of the dummy’s unblinking eyes to the impossible date of arrest (February 31st). The document claims to be from the Detroit Police Department’s “Bureau of Identification” and is dated with the year 1924. 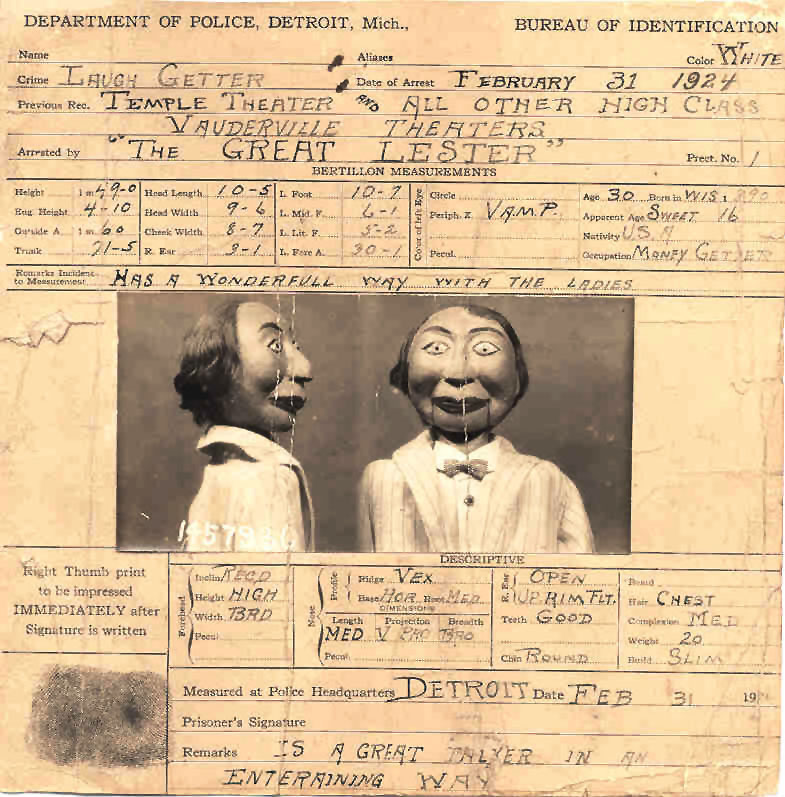 According to Vent Haven Museum curator Lisa Sweasy, the fake police report above is actually a promotional card created by Harry Lester, a.k.a. “The Great Lester,” a turn-of-the-century vaudeville performer and master ventriloquist who was the highest-paid such artist of his time. Sweasy said the card probably wasn’t promoting a specific event, but it does name-drop a Detroit institution where Lester likely performed: the Temple Theater, an early 20th century vaudeville hall near Campus Martius that closed in 1928. Harry Lester, a.k.a. “The Great Lester” with Frank Byron Jr. on his knee. 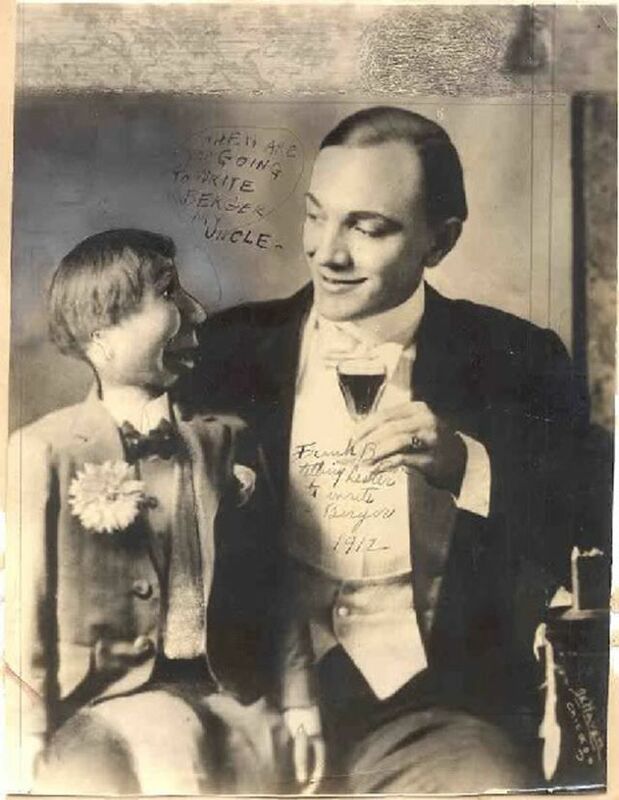 Harry Lester and his homemade ventriloquist dummy, Frank Byron Jr., were a popular addition to any vaudeville bill. Their fame never reached the heights of their protégés, Edgar Bergen and Charlie McCarthy, but that may be more a testament to the influence of film and television for a later generation than a sign of Lester and Frank’s appeal. Bergen was first inspired by Lester, was taught by him, and acknowledged him as the greatest ventriloquist of all time. At the height of his fame, Harry Lester was making $1,500 per week (today’s equivalent of earning $31,000 weekly). Vaudeville performances were wildly popular, and ventriloquist dummies like Frank Byron, Jr. were not interpreted as eerie or ghastly in pop culture like they are today. At that time, an advertisement such as this would have been taken as funny or clever – not creepy.